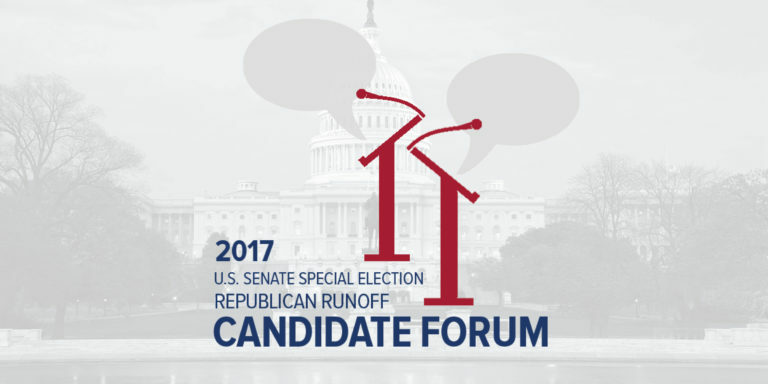 Former Alabama Chief Justice Roy Moore and Sen. Luther Strange are scheduled to go head-to-head in an upcoming candidate forum hosted by the Alabama Policy Institute and Samford University. The event will take place from 6:00 – 7:30 p.m. on the university’s Wright Center in Birmingham on Sept. 21, just days ahead of the Sept. 26 runoff election. Alabamians are invited to submit questions to the candidates via Twitter using the #AskAL. Cameron Smith, columnist for the Alabama Media Group, will moderate the event which is free and open to the public. Tickets may be reserved at AlabamaPolicy.org/Forum. The winner of the runoff election will advance to a Dec. 12 general election where they will face Democrat Doug Jones.